These kelims celebrate the 5,000 acres of historic London parkland of the eight Royal Parks with a commonwealth heritage and leaf inspired crown design to reproduce the emblem of the Royal Parks. Perfect for use as a picnic rug in the park with its easy-to-fold flat weave Kelim texture, this striking design looks fabulous in interior schemes as a floor covering or wall hanging for a majestic statement. 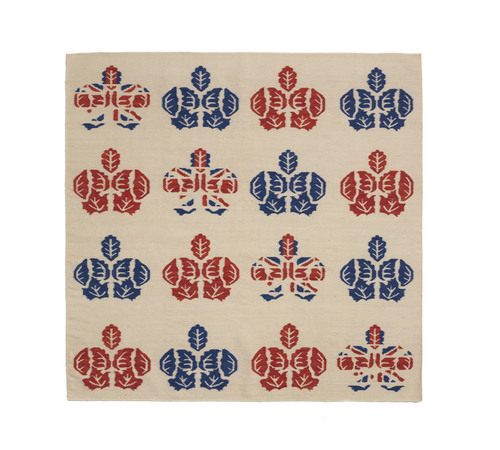 Skillfully handmade from 100% New Zealand wool, each unique kelim flatweave beautifully incorporates a red, white and blue colour palette to reflect the union jack flag making it a wonderful heirloom piece.